Step out of the city life by going to Seitsemisen Kansallispuisto and Yyteri Beach. Get some cultural insight at Vapriikin Museokeskus and Amuri Museum of Workers' Housing. Get out of town with these interesting Tampere side-trips: Paijatsalo Trail (in Sysma), Birthplace of Jean Sibelius (in Haemeenlinna) and Central Pori Church (Keski-Porin kirkko) (in Pori). Next up on the itinerary: enjoy breathtaking views from Pyynikki Park and Observation Tower, take in the spiritual surroundings of Tampere Cathedral, get engrossed in the history at Emil Aaltosen Museo, and examine the collection at The Finnish Labour Museum Werstas. To find where to stay, more things to do, maps, and other tourist information, read our Tampere trip itinerary planning site . Montreal, Canada to Tampere is an approximately 19.5-hour flight. You'll lose 7 hours traveling from Montreal to Tampere due to the time zone difference. Expect little chillier temperatures when traveling from Montreal in May; daily highs in Tampere reach 17°C and lows reach 4°C. Wrap up your sightseeing on the 17th (Fri) to allow time to take a train to Helsinki. Get in touch with nature at Teijo national park and Niivermaki Nature Conservation Area. Get some cultural insight at Seurasaari Island and Open-Air Museum and Natural History Museum (Luonnontieteellinen Museo). Explore the numerous day-trip ideas around Helsinki: Nuuksio National Park (in Espoo), Ekenas Archipelago National Park (in Raseborg) and Tulliniemi Nature Path (in Hanko). Spend the 24th (Fri) exploring nature at Valkmusa National Park. 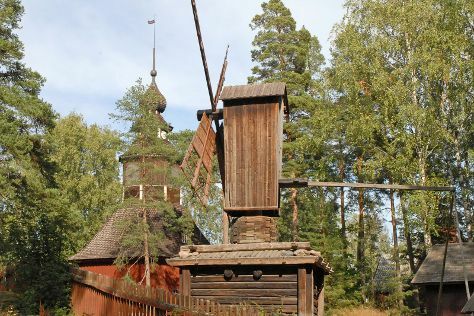 And it doesn't end there: admire the masterpieces at Kansallisgalleria, stroll through Runeberg Park, steep yourself in history at Mannerheim Museum, and trek along Santalahti Nature Trail. To find maps, more things to do, other places to visit, and more tourist information, read Helsinki trip maker website . You can take a train from Tampere to Helsinki in 2 hours. Alternatively, you can drive; or fly. In May, daily temperatures in Helsinki can reach 18°C, while at night they dip to 7°C. Finish your sightseeing early on the 25th (Sat) so you can travel back home.